You probably think about them less often than you should. 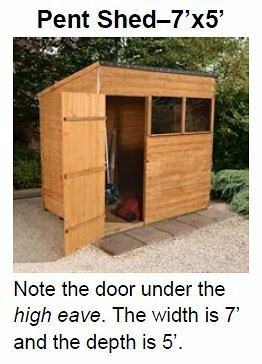 When it comes to tying a garden or outdoor space together, there are few items more valuable than a high-quality shed. 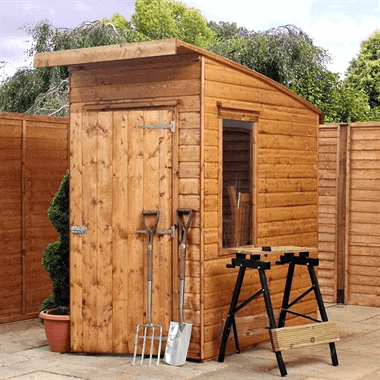 Here we’ll walk you through the ins and outs of sheds—specifically timber garden sheds—highlighting difference in purpose, design, features, and function. We’ll talk cladding, roof types, construction options, and everything in between. 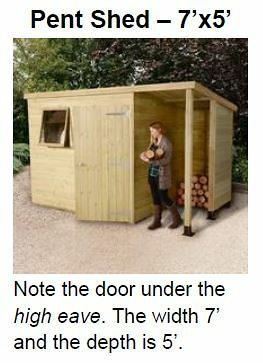 When you’re done reading this document, you’ll be as close to an expert on timber garden sheds as anyone could hope to be. 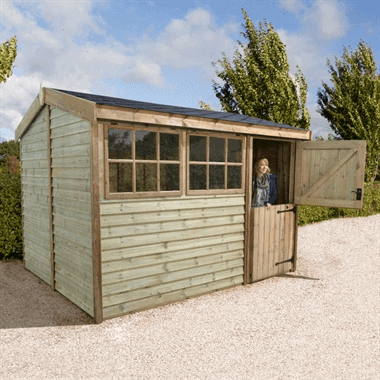 Rather than inundate you with information, we’ve created a simple overview of the standard garden sheds available in the UK. Size isn’t the most important thing, but it IS important. The actual inner dimensions of the shed will almost always be smaller—due to overhang, wall thickness, framing, etc.—than the published dimensions. 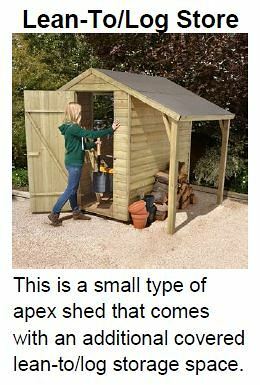 Generally, Apex Sheds list their size as depth by width, and have a door located on the shorter side (width) of the structure. 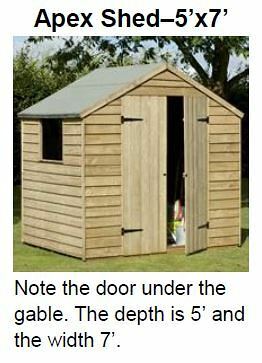 However, in a Reverse Apex Shed the door is located under the eaves, and the dimensions are listed as width by depth in reverse order. 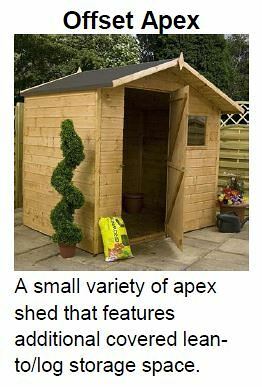 Unlike Apex Sheds, Pent Sheds usually feature a door that is located on the higher side of the shed and its dimensions are listed in reverse order from Apex Sheds. 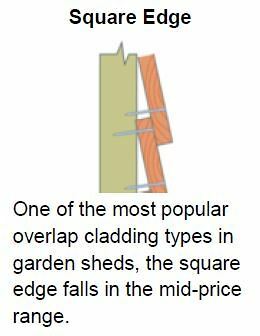 Cladding—though constantly overlooked—is an important component of garden sheds and timber structures in general. There are various cladding types—some more popular than others—that are often distinguished by material, price, and quality of construction. 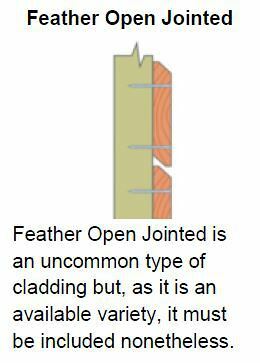 To fully understand the types of cladding, look at the graphics below and on subsequent pages. 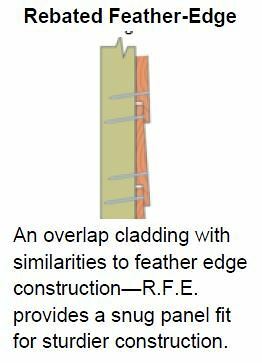 Whether talking about feathered edge (left) or square edge (right), overlap cladding is both the most common and the most popular. 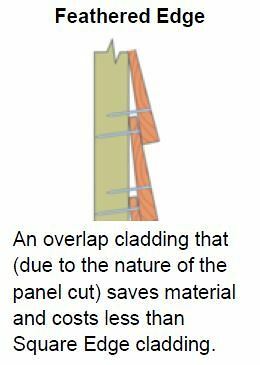 Though overlap cladding isn’t necessarily the best type of cladding manufactured, it is economical and easy to build with. Typically consisting of 8mm sawn-timber, slats are nailed together one over the other to create the “overlap” that gives this cladding its namesake. Not suitable to for attaching shelving or heavy items to the walls. 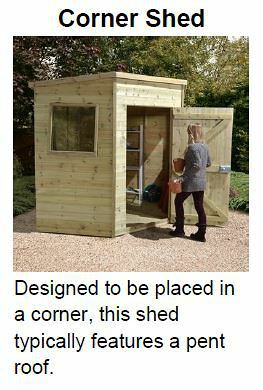 At minimum, treat your overlapping cladding with a spirit-based solution to protect the wood from the elements and ensure your shed lasts. You can also treat your shed with a water-based outdoor paint from Cuprinol Garden Shades. In addition to giving your shed a splash of colour, the paint will sufficiently protect it from the elements—however—the paint will need retouching every 12-months in order to guarantee sufficient sealing. To obtain maximum protection, treat the overlap with a spirit-based solution first, and then go over it with a water-based paint—do know, however, that the paint colour does not always come out true when laid over spirit-treated timber. 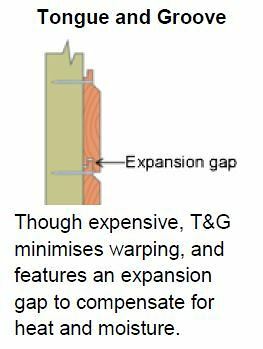 Due to their similarities, there is often confusion between shiplap and T&G cladding. 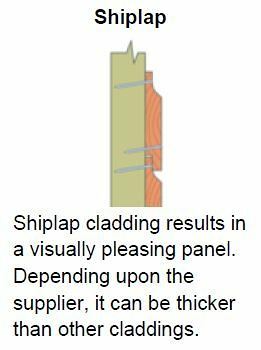 What makes Shiplap cladding distinct is the small channel/groove that runs parallel with the timber. Though minor, this channel is actually hugely important as it directs precipitation away from the shed quickly and efficiently. Shiplap cladding provides additional strength and aesthetic appeal thanks to its neat, interlocking panel system. 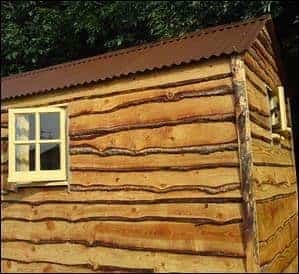 At minimum, treat your shiplap cladding with a spirit-based solution to protect the wood from the elements and ensure your shed lasts. To obtain maximum protection, treat the cladding with a spirit-based solution first, and then go over it with a water-based paint—do know, however, that the paint colour does not always come out true when laid over spirit-treated timber. 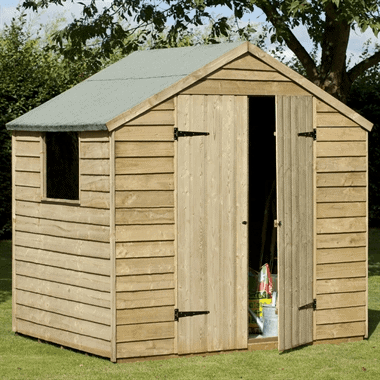 An incredibly popular style due to its aesthetic and practical appeal, Tongue & Groove cladding is specially shaped to create a robust, interlocking exterior making sheds unbelievably sturdy—if valuable or weighty items are to be stored in your shed, this cladding is your best option. Because the timber boards interlock, T&G cladding prevents water penetration and provides superior protection from the elements in all climates. 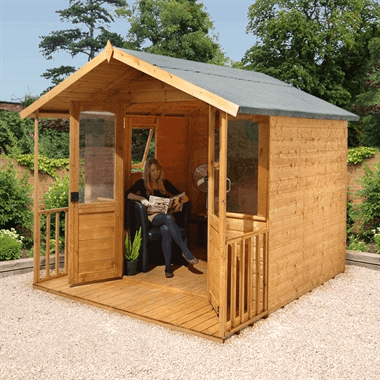 At minimum, treat your T&G cladding with a spirit-based solution to protect the wood from the elements and ensure your shed lasts. Consisting of overlapping boards cut directly from a felled tree, Waney Edge cladding is rarely used in modern garden sheds because of its inefficiency and lack of durability. At best, Waney Edge cladding is highly affordable and traditionally rustic in appearance. At worst, it is a disaster waiting to happen. Without a solid roof over your head, a shed won’t be very helpful for storage, recreation, or anything else you might have in mind. Much like cladding or frames, roofs can come in a variety of different styles and materials—from polypropylene and felt, to apex and pent; the choices are only limited by your imagination. To help you wrap your head around all of the options at your disposal, examine the images and information made available below. Thanks to a high, central ceiling an Apex roof provides users with a comfortable working space. Construction features two, separate sections forming a joint at the highest point to create an upside down V shape. 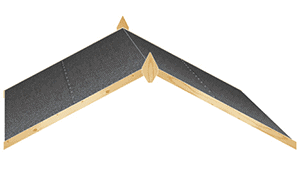 Note: some manufacturers create cheaper “Apex” roof models with a wider joint angle—thereby creating a lower ceiling—to save on material costs. 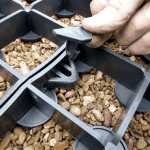 Ideal for gardens with minimal space, Pent roofing is highly practical. 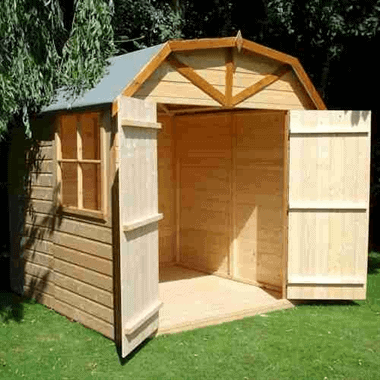 Pent sheds can fit snugly against a wall, fence, or overhanging tree. 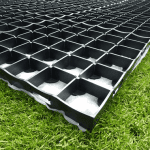 They drain rainwater with incredibly efficiency and discourage water-related damage. Lean-to roofs can adhere to Pent or Apex styling. The thing to remember with a Lean-To is there will be a wall missing, as clearly demonstrated in the picture of the Pent Lean-To in the image to the left. The canopy roof creates an extension beyond the shed structure for the creation of sheltered outdoor work/leisure. It comes in both Apex (left) and Pent (below) stylings and is often seen in tandem with a veranda (left) or log/firewood store (below). With low eaves, a high ceiling, and an angled shape, barn roofing encourages precipitation run off without compromising internal standing height. 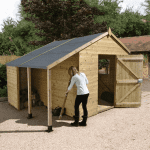 This variety of roofing is typically a feature of high-end sheds. Note: In this example (left) the doors don’t have diagonal cross-beams. This results in a lower rigidity and susceptibility to “sagging” over time. 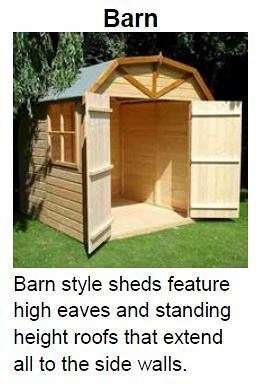 Curved roofs are rare and—in the garden shed industry—considered “special”. It is most commonly associated with summerhouses. 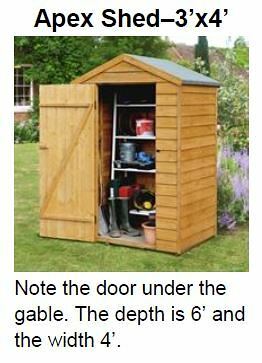 Note: The curved roof is only included in this document for thoroughness—it truly is extremely rare in garden sheds. 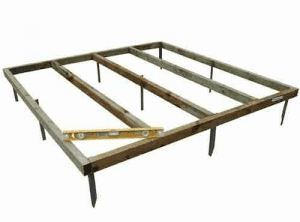 Like all roofs, the main issue with shed roofing is lifespan. Continual exposure to the elements, seasons, and sunlight means your roof will need replacement every 10-15 years. Most roofs will be built using two materials—wood and roof felt. Wood will form the frame and foundation of the roof while the felt acts as the protective layer shielding the wood from the elements. The glossiness of this roof (left) indicates that it is polypropylene. This material—while highly resistant to the elements—is not exceedingly popular. Note: Polypropylene roofing reduces build time by 66% and is UV stabilised to handle typical British weather. The material is maintenance free and acts as an insulator for the building. However—because the roof is thin, it does not stand up well to heavy snow or leaf loads. 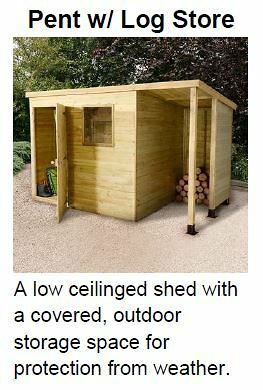 If your shed is going to be in an area where it is subject to heavy roof weight, consider a strong wooden or onduline roof. More often than not, manufacturers will use the minimal amount of framing required in order to keep material costs low. Where relevant, manufactures will mention “extra-strong” framing when it’s relevant, particularly if it emphasises strength in an important part of the shed. 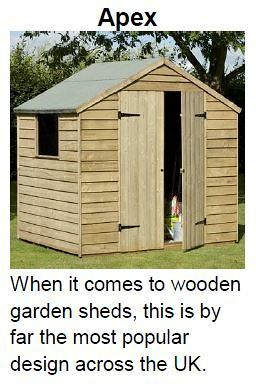 Note: Framing is an extensive and complex topic when talking about sheds or garden buildings in general. We will be fully documenting the subject in greater detail over time. 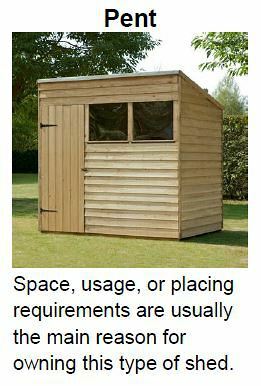 Again this is a major cost savings factor in shed manufacturing (and even delivery). As the name suggests, pressure treated timber goes through a process that uses pressure to force chemical preservatives deep into the wood and grain. The pressure treatment process helps deter rot and fungal decay, thereby increasing the lifespan of the timber. 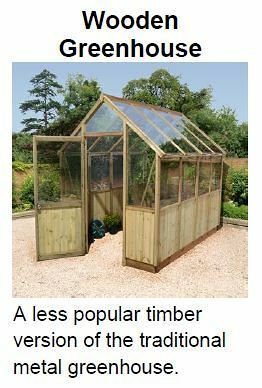 As it has been treated during manufacturing, the timber does not require any additional sealing before or after shed construction. Dip treated timber has been through a less thorough process of protection that applies a preservative to the surface of the wood. Timber structures with a ‘cedar red’ hue have often gone through dip treatment. Though shed manufacturers will often “guarantee” dip treated timber for up to 10 years, it will need regular reapplication—at least once every 12 months—to remain in good condition and avoid rot/decay. Dip treated timber is less expensive to purchase than its pressure treated cousin, but preservation costs can mount up in the long run. 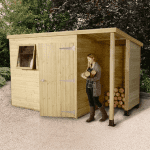 Most sheds come with a floor, but check with the individual retailer just to be sure. 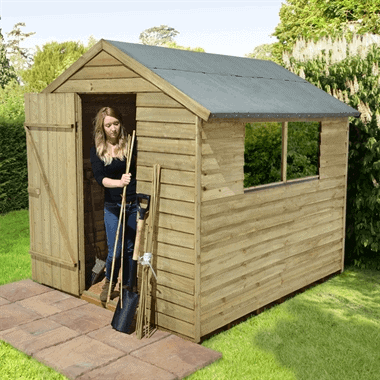 Know that a garden shed should never be placed on the bare ground or lawn, as that will put the entire structure at risk of wet rot and insect infestation. Always purchase a shed base. 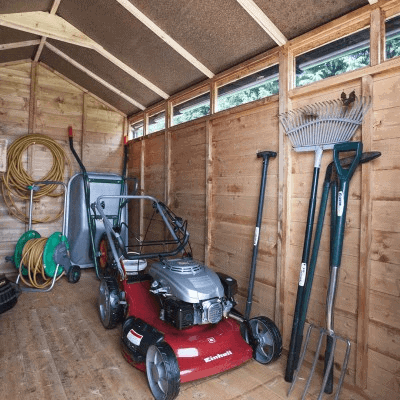 When it comes to a shed, there are a variety of sizes, styles, and materials to choose from—in fact, you don’t even really need a door if you don’t want one. 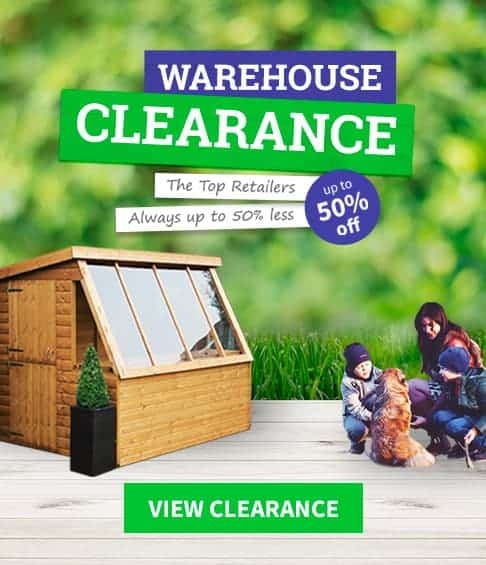 As the vast majority of sheds sold is 8×6, 7×5 and 6×4, the most common door type is a single door. Note: The diagonal cross-beam on the door (left) provides extra structural rigidity and deters “sagging”. 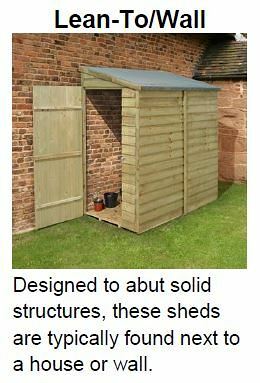 The most common type of door for large sheds (8’+ wide), the double door is another highly-traditional option. Note: The top of these double doors (left) reach the roof—this is an indicator of material-saving, cost-cutting behaviour from the manufacturer. Another sign?—low eaves a window that is flush with the roof. Though uncommon, the stable door is not without its advantages. Unlike single piece doors, the stable door can be partially opened giving users the ability to keep animals and children in or out, while still enjoying generous air circulation. Start with a hard surface to help prevent subsidence which can lead to timber bowing, frame cracking, and even broken windows. Making sure the base is level will help keep moisture—which leads to rot and decay—from pooling in any one area of the shed as well. Use concrete or patio slabs to create a level standing. Looking for an easier alternative?—try a robust timber base kit like the one demonstrated in 3rd photo (centre) below. 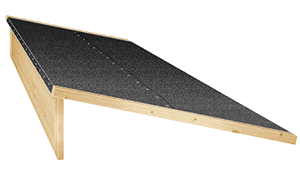 Composite, ready-to-go shed bases (below) are usually supplied in flat-pack form for self-assembly. 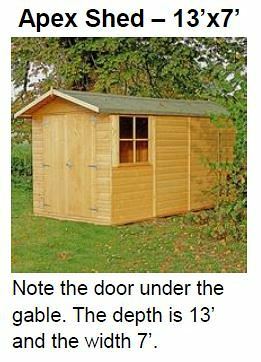 Finally, there’s security and privacy—two oft overlooked elements that are important to almost any shed owner. Though not as aesthetically pleasing, sheds without windows are always more secure and private than their windowed counterparts. 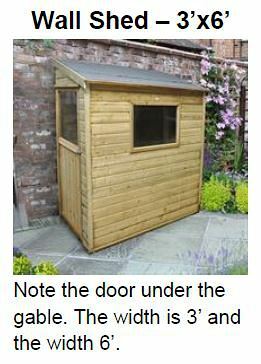 Note: Some sheds have small, discrete windows that allow light in but obscure internal contents. Stronger designs (like those that incorporate shiplap and T&G cladding) offer more natural security because they are—quite literally—harder to break into. Locks, alarms, and automatic lighting are also very practical intruder deterrents. 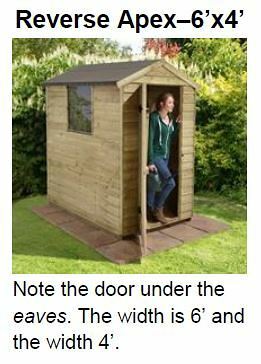 If the protection of valuables is a primary concern when shopping for a shed, look for sheds labelled as “privacy shed” or “security shed”. 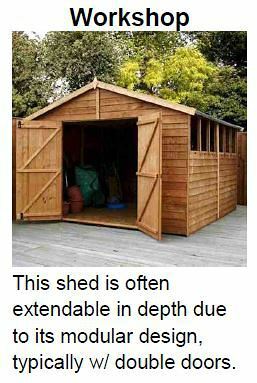 Thanks for taking the time to examine our comprehensive overview of timber sheds. As the world of shed making and design continues to evolve, we’ll do our very best to update this document with frequency.